26 December: Not many folk out racing this Christmas, but Rob Olliver found a cracking race in the snow - the Otley Chevin Chase. The 7-mile off-road course was very wintry but suited Rob's newly found off road skills as he finished well up in the 825 strong field. 13 December: Stevie Stockton was a fabulous 10th in the European XC Championships. Stevie was fourth counter in the victorious British team - just pipping Steph Twell! Results. Well done Stevie! At the new Tatton Pud Plod 10k event, Ed Crowther turned in a strong performance to win the race (although not wearing his club colours!). John Carroll recommends the race for next year. Steve Caldwell ran well considering he ran XC the day before! Pauline Davies had an excellent run at the Great Langdale 10k in Cumbria. Pauline was more than two minutes quicker than last year and was 1st LV55. John also ran and was pleased to finish without injury but accepting that he's not in top form yet! At the Stockport 10, Colin Rathbone put his previous days efforts behind him as he finished 2nd V65. John Todd was 8th MV45 and Gemma Barnett 14th lady. Mike Harrington and Iain Wedge made the long journey south to find a fast half marathon - only to find out the first nine miles of the Bedford Half Marathon were all uphill (I assume the rest was downhill!). 12 December: The final match at the North Staffs League was on the tough course at Westwood High. The senior men's team was out in force and managed to ensure promotion into Division One with a season best team performance (this was despite some seasonal bugs and other ailments affecting most of the team)! James Griffiths was the highest finisher in the race with a superb run for 10th place. Andy Clews started fast but faded to 13th place - however this was still good enough to win the junior league and to finish a brilliant 2nd (tbc) in the senior league. Photos in the gallery and full results awaited. In the U17 race Andrew Miles was an excellent 5th (which would have been higher if he hadn't run the 1st hill like a sprint rep!). 6 December: At the Helena Tipping 10k, the verdict was still out on whether this is a fast or slow course, but there were some strong performances from the club. Stu Doyle was 4th overall and 1st MV35 and Maggie Fenn was 2nd LV35. Nicky Archer ran an excellent race in the Las Vegas Marathon, finishing 6th Elite Lady. After an early morning 6:15am start, Nicky finished in 2 hours 42 minutes. Nicky had reached the halfway point in 1:19. No doubt Nicky would have like to have dipped under 2:40 (we await comment!) but this is still an impressive performance and a massive PB! Well done Nic! (*Blog just added*). Dave "Stat-man" Gough has pointed out this is the 10th best performance by a British Athlete this year! A great night at the W'OSCARS (hangover this morning!). BIG thanks to Bernie and Goffy for organising it. The prize winners were: Tennis Ball Challenge: BERNIE JONES! Most Improved Athlete: HELEN SMITH and JO MOLYNEAUX. Performance of the Year: ANDY GIBBS . Member of the Year: TOM ANNABLE. Here's a reminder of the nominations. Thanks also to Marcus (and The Terrace) for supplying the cakes, to the Club Committee for agreeing to make a financial donation to support the event and to Tesco for providing the raffle prizes. 29 November: Helen Smith defended her title as she finished 1st lady at the Knowsley Safari Park 10k. Helen believe the course was about 0.5 mile short. Still an excellent time though! Congratulations to Stevie Stockton who finished an excellent 3rd place in the ladies U23 race at the UK Cross Challenge meeting at Sefton Park in Liverpool. This performance qualifies Stevie for the European XC! A smaller turn out than usual for the Cheddleton 10k. Maggie Fenn once again showed her potential as she finished 9th lady and 4th LV35. Colin enjoyed the event - one of his favourites - and ran well to win his age category! For once Carole missed out on the prizes as she finished 3rd LV55. Marcus Crompton made his regular trip to do the Wesham 10k in Lancashire. In good racing conditions, Marcus was very pleased with his time, showing he's on track to get back to full fitness in the New Year! 24 November: Great day for Nic A at the NCAA - blog updated. 21 November: Fabulous conditions for the 3rd match in the North Wales Cross-Country League at Bangor - gale force winds, lots of mud and driving rain! On a modified course, the performance of the day was Pauline Davies who cruised through the mud to finish 1st LV55. Tom had a much more confident run than of late and was pleased with 14th place and 1st MV45. Darren started much quicker than usual and faded slightly as a result but still finished an excellent 34th. David Jury didn't take to the mud but was still well up the field, as was Tony Archer who ran strongly for his highest finish of the season. Great fun! 15 November: More XC action, this time for the Manchester XC League at Sherdley Park. Not a big turn out for this league this year but the usual stalwarts were out to enjoy the mud! Col and Pauline both 2nd in their age categories. Pics in the gallery. 14 November: We have all marvelled at his focus and dedication to gaining international selection - and it paid off as Andy Gibbs pulled on his first England vest for the Home International Masters Cross-Country in Birmingham. This is a prestigious match with the leading masters from England, Scotland, Wales and Ireland competing. In wicked weather, on a cut up course, Andy had a terrific run finishing 23rd overall but more importantly a brilliant 4th in the MV45 category. Andy was 3rd counter in the victorious England team - earning himself a gold medal in the process. Brilliant & well done Andy! Results here. A windy and muddy day at Stafford Common for the 3rd match of the N Staffs XC League welcomed a strong club team. With promotion to division 1 being the goal of the men's team, it was a superb team effort to make that a distinct possibility - on the nearly 8 mile course the team had a season best performance. Well done lads. Great to see Maggie Fenn turn out for the ladies with a very high finish! Some pics in the gallery (thanks to Llyn C!) Next match is really important for promotion....we need a strong team out! 7 November: The popular Langley 7 race took place on Saturday in cold conditions. Some fine performances including Iain Wedge with an impressive run, Gemma was 2nd lady and Rob improved on his best for the course. A few pics in the gallery. Colin and Carole were back out on Sunday for the off-road Mad Jack 5 mile race. Carole scooped the prizes as she finished 2nd LV55. Colin came home empty handed this time but was 3rd MV65! 6 November: A terrific team performance for the senior men at the latest round of the North Staffs XC League at Park Hall. Andy Clews and Stu Doyle resumed battle near the head of the field with Andy edging into 3rd and Stu in an excellent 5th. Backed up by a big team turn-out this was Vale Royal at their best! In the ladies race Carole put her ankle injury behind her for an excellent finish. Let's make an effort next Saturday at Stafford Common to build on this great team effort! See Bryan Dales site for pics (see quick links). 1 November: Nicky's weekend race exploits updated. Video now added. See Blogs. 1 November: At the English National Cross-Country Relays in Mansfield, Vale Royal Seniors Mens' Team finished a very creditable 74th from the 151 teams. Tom Carter put in the fastest leg from the squad, while Graham Miles anchored the team with a good run considering he'd trained so hard in the week believing that there wasn't a team! (A lesson here: We need to get team's organised a bit earlier!) Strong performances by George Thompson and James Griffiths completed the team efforts. 25 October: A successful day out for the club at the Halloween Hellraiser 9 mile trail race nr. Nantwich. Without any mud on the course, the Hellraiser was the least hellish of the weekends races but was an enjoyable alternative to the usual Sunday run. Tom was 3rd overall, Tony 1st MV55 and new lady member Maggie Fenn was 2nd lady. If you like running over stiles then you'd enjoy this race! Photos and results on Bryan Dale Race Photos. SNOWDONIA MARATHON - NO CAKEWALK! 24 October: In a repeat of last years epic conditions (gales and lashing rain), an intrepid group took on the tough challenge of the Snowdonia Marathon. Steve Smith had an outstanding run in his debut marathon finishing in 4:13. After passing Steve at 9 miles, Paul Clutterbuck suffered cramp and faded to finish in 4:34 describing the race as hell (and vowing to drink more next time!). Steve Bradshaw completed the race too (not heard Steve's report yet). This is one tough race and in these conditions the finishers medal is well earnt. Well done lads! Respect! The lads appreciated the excellent support from Glyn and Lisa - "Keep Werkin' Lads!". A few pics in the gallery. Meanwhile another elite band took on the less daunting but still significant challenge of the Manchester XC League at Heaton Park. In the ladies race, Carole and Pauline were in action though Carole failed to finish (and has vowed to restart her training now!) and Colin was the only club member in the men's race. Pauline was an excellent 2nd LV55. Pics in the gallery. 18 October: One performance that we missed: Iain Wedge completed the Southport 10k in just under 38 minutes. Not bad considering his lack of sleep since becoming a dad! 18 October: Mike Harrington is getting back to form as he dips under 1:20 for the half marathon at the Cardiff Half Marathon. Mike recommends the race highly! and further afield it's good to see Mary Tavener and Mike Weedall back racing as they both complete the Amsterdam Half Marathon in 1.35.12. News from New Mexico updated! 17 October: It is credit to Vale Royal that the seniors qualified for the finals of the National 6-stage Relays in Sutton Park. In todays finals the team had a terrific performance from a strong squad, eventually finishing in 66th place (the standard is incredible!). The fastest leg of the day (quoted to be 5.847 km) was from Chris Perry who was just ahead of Andy Clews and Stu Doyle. In a second group, Ed Crowther, Zach Cross and Tom Annable (the old man of the team!) were all separated by a handful of seconds. Superb to see Vale Royal AC pulling together to put a great team out! To give a rather 'sobering' context to the times, Mo Farah ran the fastest leg of the day in 16:33 - awesome! CONGRATULATIONS TO ANDY GIBBS ON HIS SELECTION FOR THE ENGLAND CROSS-COUNTRY TEAM! 12 October: There was a good turn out for Vale Royal at the Congelton Half and Quarter Marathons. In fine conditions, it was Stu Doyle again flying the colours in the lead group with a good 1:15 on this tough course - good enough for 3rd place. Pete Clayton broke 90 minutes followed in a close group finish by Paul and Gemma (who was 3rd lady)! In the quarter marathon Mike Harrington was an excellent 4th and it's good to see Helen is still competing and doing well in 14th place......hopefully more to come! 11 October: An excellent course at Bridgnorth welcomed the Vale Royal cross-country squad for the 2nd match of the North Wales XC League. In very warm conditions, Pauline Davies had a strong run to finish 1st LV55. Good to see Carole running too as she recovers from her ankle injury. In the men's race Tom was pleased to be 1st MV45 despite feeling the effects of last weekend. David Jury showed excellent progress for 57th place, showing he has a cracking sprint finish! Tony yet again amazed himself with his form, and Colin and Marcus continued to progress as they get back to fitness. We still need a few more out to make a team though! Results will be posted on the new NWCC website! Photo's in the gallery. 6 October: Two pics from the Sandstone Trail to show we can get teams out (as we have at the 1st XC leagues!). Don't forget that the next matches of both the N Wales (10 Oct) and N Staffs (7 Nov) Leagues need a good turn out to build on our earlier great team work! Get them in your diary now! We have a real chance of doing well in both! The rest of the Sandstone pics are in the Gallery. 4 October: There were perfect conditions for the Sandstone Trail Race and some superb performances too. Tom and Jo were in the prizes in the A race with both of them winning their age categories (though Tom did so only by virtue of the faster vets winning the race!). Jo was some 14 minutes (and 26 seconds!) faster than last year despite having a cold! Without doubt the performance of the day! Tom failed to repeat last years win but improved his time for the 17.1 mile course despite running out of steam in the latter stages of the race. Rob ran further than he's ever done before but showed his natural endurance with a terrific run. In the B-race Dave G had an excellent top-10 finish followed by the revitalised Tony and a determined Dave H (setting an excellent PB for the course!). Helen Smith was reported to be the most impressive runner of the day up the last hill and had a superb run for a top 50 finish. Great runs too by both Steve's and a determined Paul! Well done to all. 3 October: Race News from New Mexico updated. Another full men's team for the 2nd cross-country of the season! The first round of the N Staffs XC League at Lyme Valley saw closely fought contests at both ends of the field with Stu Doyle and Andy Clews battling to 5th and 7rh respectively (apologies for getting this the wrong way round in early reports!) and John Davies and Colin Rathbone in a close finish in 215th and 216th! In between them was Pete Maher in 68th and Marcus Crompton in 142nd. Next match is at Park Hall on the 7th Novenber where we should try and get as strong a team as possible out! 27 September: At the very tough Macclesfield Half Marathon, Mike Harrington put the previous days cross-country experience behind him as he led the team home with a creditable 1:24. Dave Murphy debuted at the distance for an excellent 1:34 (it will be interesting to find out if he sprinted the first half mile!). 26 September: The men's senior team qualified for the finals in the Northern 6-stage Relays with a solid team performance in Leeds. The team finished in 25th place to just make the qualifying mark. Well done! It's great to see a full men's team out for the 1st North Wales Cross-Country League in Colwyn Bay. In typically glorious weather for Colwyn Bay, Tom had a best ever XC finish in 14th place and 1st MV45. New member David Jury ran in Vale Royal colours for the 1st time and had a promising run in 66th place. Both were backed up by some excellent runs a little further down the field from Mike (warming up for tomorrow's Macclesfield Half Marathon), Tony, Marcus and Dave. John Davies showed his speedwork pays off with a blistering finish, and Colin Rathbone couldn't resist running despite his recent operation. Next match (10 October) is not at Lilleshall as per usual. It has been moved to Bridgnorth which is said to be a terrific course. Remember too that the 1st N Staffs League is on 3rd October. At the Sutton 6 10k Stu Doyle and Gemma Barnett were defending their positions in the last round of the Cheshire Grand Prix. Both had superb runs with Stu Doyle finishing 4th in the race and easily breaking 34 minutes and Gemma setting a new PB just outside 40 minutes. Stu finished a fantastic 2nd and Gemma a brilliant 2nd (or 3rd?) Lady in Cheshire GP. GP results. It was an impressive day for the club at the NW Road Relay Championship. The club won 3 of the 8 NW championships and 4 of the Cheshire Championships! A proud day for the club as "It's Vale Royal again!" sounded out from the PA repeatedly through the day. Well done to all. Read about it here. Four Vale Royal vests were amongst the sea of runners in the Great North Run Half Marathon in Tyneside. In perfect racing conditions, Zach Cross had an excellent PB in 75 minutes and showed he's continuing to improve. Helen Smith had an excellent sub 1:40 run - someway inside her run at Helsby earlier this year and a sign of her improvement too. The club AGM is on the 5th October at The Lion in Moulton @ 7:30pm. Members are welcome to attend. Harry Evans is stepping down as Chairman and the club is looking for someone to fill his shoes! If you're interested or want to find out more about the role please speak to Harry . 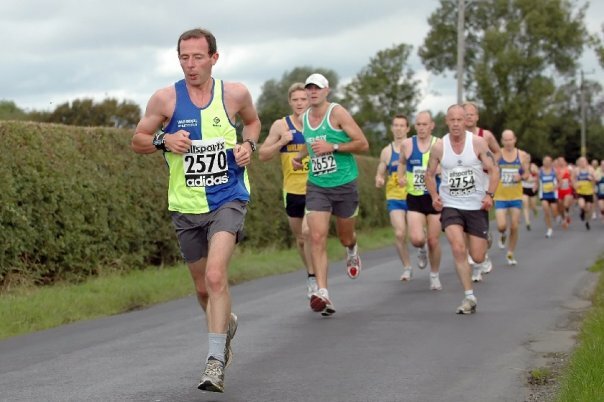 13 September: At the Sandbach 10k, there was a club success with Stu Doyle winning the race. Gemma Todd finished 2nd lady. Well done Stu and Gemma. Rob Olliver showed he's making progress as he was 90s quicker than last year. Meanwhile in Wales, despite the withdrawal of one of their elite runners from the race , the organisers decided to proceed with the Lake Vyrnwy Half Marathon. Three Vale Royal athletes turned out to race round the scenic course in fine though rather warm weather. At the Gawsworth Multi-Terrain 10k, David Jury had a surprise when he ran past the 10k marker someway before the finish! Despite the long course David highly recommends the race! 10 September: Training time trial times added to the training page. Congratulations to Lord Archer for an impressive effort on his 55th birthday! 6 September: Paul Clutterbuck continued his tour of interesting races at the Derwent Trail Race in the Lake District. Paul described it as cracking race which left him questioning why people run round roundabouts and along main roads in big field 10k races! (A few expletives were edited during the transcription of his text message!). Paul had a fine run on the 14k mountainous course, completing the race in 82 minutes. 5 September: Another trail race around a lake in Wales tempted Marcus out of his (excellent) shop as he accompanied Tom to do the Llyn Brenig Trail Race in Denbighshire. In very windy conditions Tom finished the 9 mile race in 3rd place and 1st MV45. 1 September: N Archer - overseas race news! Not Nicky this time though but, the other globetrotting member of Team Archer, Nathan! Competing in the Lake Macquarie 10.5km in Australia, Nathan completed the course in 50.14 to take 131st position out of 1,292 finishers. RUNNERS SPECIFIC TRAINING SESSION - Glyn Evans is resuming his fitness sessions on Monday nights from 7th September (7.05pm – 8.05pm), at a cost of £5 per session, in the farmers barn in Bostock, training will be general conditioning and mainly core strength. For any further details contact Glyn on 07949588151. Please support this, if you can. 27 August: It was a damp and breezy night for the Capenhurst 5K. David was disappointed with his time and has promised to train harder as soon as he is initiated into the club! 177 finishers. 23 August: Five Vale Royal runners turned out to run around the many roundabouts at the Birchwood 10k. Darren has been racing regularly over the last few weeks and had a strong run in the windy conditions for 62nd place. Paul Lloyd edged nearer that 40 minute barrier with an excellent 41 minute run. This was a strange choice of race for the clubs mountain race specialist.....that's Paul C by the way.....his texted race report was unpublishable but, in summary, it could be said to be less than complimentary about the Birchwood course! Mary and Barry had good runs although both were somewhat short of their 10k personal bests. 891 finishers. 18 August: We received an email thanking everyone at the Gt Warford 10. This is a good reflection on all of us and great for the club. Read it here. 16 August: At the latest round of the Cheshire Grand Prix at the Great Warford 10, Stuart Doyle did his best to maintain his lead in the series with an excellent run, finishing in 6th place. The ladies team of Jo, Kate and Gemma won the team prize. It is reported that the race was an accurate 10 miles this year though i expect Mike H thinks it was a few yards long! 14 August: In the Teggs nose fell race on Saturday 8 August, in form, Darren Cottier had another fine run to finish in 17th place in a time of 61.28. 9 August: It's claimed to be one of the hilliest races in the country but Steve Smith, Tom Armstrong and Paul Lloyd still decided to enter the Meerbrook 15k. They confirm that the race is indeed hilly! 6 August: The final Sale Sizzler 5K saw significantly improved performances for both Darren and David. Good to see them getting in shape ready for cross-country season . Colin will approve! Barry Chambers was just inside his time from the first of the three event series - not bad considering he'd done Pie and Peas the night before! Liz Renondeau and Andy Blair were out too recording 19:03 and 19:33 respectively. At the Chernobyl 10k Challenge near Preston in Lancashire, Paul Lloyd flew the flag for Vale Royal with a strong 42:37! 29 July: In the 'Wizard' 5 mile race at Alderley Edge. where conditions were described as 'hideous' underfoot in the rain, Mike Harrington produced an excellent run, to be back amongst the front runners, finishing 7th in a time of 31.49. also 'enjoying' an evening in the mud was Dave 'spud' Murphy who finished 34th in 37.14. 27 July: At the latest of the Sale Sizzler 5k series, Darren Cottier and Pat Toolis turned out to test Darren's claim the course was now super fast - both had solid runs but someway off their bests so it's obviously not that quick! 23 July: Here are some performances we missed: At the 1st Sale Sizzler 5K on 25th June, Pete Maher was 37th in 17:57. At the Horwich 5 mile race at Rivington on 15th July, Barry Chambers was 114th in 37:46. 18 July: I know it feels more like a cycling club website nowadays, but there is one man proving we are still made of sterner stuff and carrying on with the running! That man is Paul Clutterbuck who today finished the Snowdon Mountain Race in 2 hours 9 minutes (that's straight up and down from Llanberris). Paul says he had a bad ascent and a good descent. (Can't guess why?). On a sadder note, 2 runners were seriously injured during the race and were air-lifted off. It's on S4C Sunday night if you want to watch the race. 16 July: They've made it! 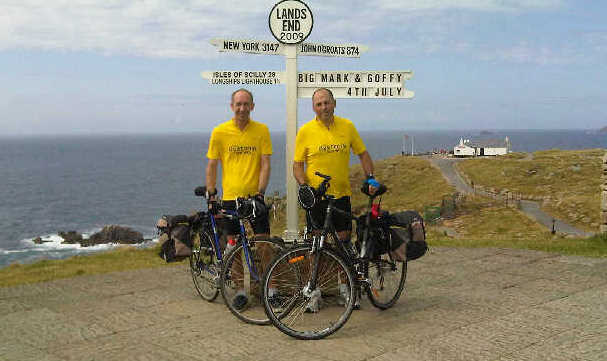 http://www.justgiving.com/lejog-bigmarkandgoffy. 14 July: An enjoyable night out (at least for most of us) at the Gun Run Fell Race near Wincle in Derbyshire (**Photos in Gallery**). The course was terrific with a fabulous runnable descent but a bit of a sting in the tail. Good to see an Archer competing and enjoying the fells even if Marcus ungraciously nipped by Tony in the last few hundred uphill yards! 13 July: Competing for the second time this weekend Nicky Archer had another fine run in the Ladies 5000m at the AAA's Track Championships. The time of 16:59 is short of her best but is very repectable given the previous evening's race and the strong winds. Nic finished in 8th place in the championship. Well done Nic! 11 July: At the AAA's Track Championships, Nic Archer was competing in the women's 10000m. In a very high standard race with a number of top-class overseas internationals (and an Olympic champion!) in the field, Nic ran an excellent 34:59 in the wet and windy conditions for 8th place. The race was won in the 4th fastest time ever by Meseret Dafar in 29:59.... an unbelievable performance. 5 July: Back to running: It's a welcome sight seeing Nicky Archer back racing in the UK and she didn't disappoint with victory in the City of Manchester 10k. It was close though with Nic finding an impressive sprint finish to run down Joyce Kandie from Kenya in the closing 100m! Also having a good run was Claire Beresford who finished 8th lady in the big field. Looks like times were generally not that fast, suggesting that the hot conditions were hard work! Continuing his strange obsession with Yorkshire half marathons, Rob Olliver was back in action at the Burns Valley Half Marathon. In very hot conditions, Rob was pleased to get close to last years time on this very tough course. 1 July: A massive 7 minute improvement on his best for Matt Brown at the "Hot Foot up Moel Famau fell race" shows that he has fully recovered from his health problems earlier in the year. Matt finished in 44 minutes in the very tough race in the hottest conditions for years. On the same night, Vale Royal Ladies cleaned up at the Birchwood Ladies 5k. The race was won by Tessa McCormick, with Vale Royal taking the team prize too.